Miami had to move back their Week 1 game against Tampa Bay, so this is the start of what could be a long season. The team called Jay Cutler out of retirement after Ryan Tannehill’s season-ending injury, and it remains to be seen how ready Cutler is. The Chargers look to bounce back on a short week after a tough loss to the Broncos and play their first game at home in Los Angeles. Cutler threw four touchdowns all last season and then tried to retire. Maybe let him show he’s ready to play before you throw him into your lineup? 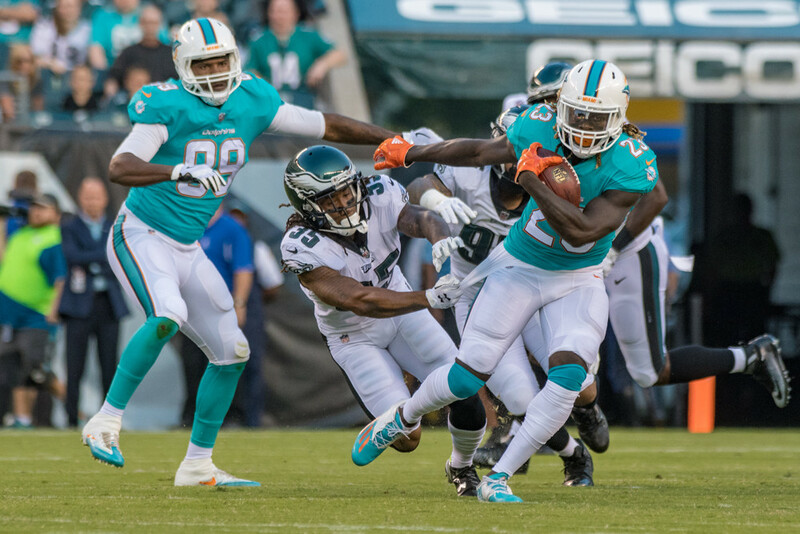 Ajayi looked spry in preseason and should get the ball plenty as the Dolphins ease Cutler back into action. The Chargers allowed the third most TDs to running backs last season and plenty of work in the passing game, and Cutler loves to check down to his running backs. Ajayi looks like a top five play this week. Parker was a late-rising sleeper after a huge preseason that saw him jump from the 9th round to the 5th during draft month. He showed great rapport with Cutler, no real surprise as a tall lanky target that’s the exact sort of guy Cutler has always loved throwing to in Brandon Marshall and Alshon Jeffery. The Chargers allowed just 12 TDs to WRs last season, fourth fewest in the league. Landry might be the second or third option in a running attack. He’s a low end flex until he proves he’s going to see enough passes with Cutler. Like Parker, Thomas is a big tight end Cutler could look for in the redzone, but the Chargers were good against tight ends last year. Thomas is not a recommended start yet. It took Rivers awhile to get things moving Monday night against the Broncos but then he threw 3 TDs against a team that allowed only 12 all last season. Miami was on the other end of the spectrum with 30 TDs and the fourth most points allowed to opposing QBs. Rivers could be a top five play this week. Miami allowed the third fewest TDs to RBs last season but the fourth most yards. That’s a bad match for Gordon, who usually struggles to put up yardage and relies on TDs to carry his value. This could be a down week. Allen looked healthy Monday night and caught a touchdown against the Broncos, something only six WRs did last season. Now he gets a porous Miami secondary that allowed the fifth most points to receivers last year. This could be Allen’s welcoming back party. Travis Benjamin caught a Week 1 TD, but Williams established himself as the Chargers WR2, leading the team in WR snaps and gathering three more targets than Benjamin. He’s a solid flex play against Miami’s shoddy secondary. San Diego’s vaunted tight end paired up for just two catches and 17 yards, and Henry played just 23 snaps and didn’t see a single target. But Miami allowed 10 TDs to tight ends last season, third most of any team. Gates is worth a start, and Henry might be too if you’re not too scared off.